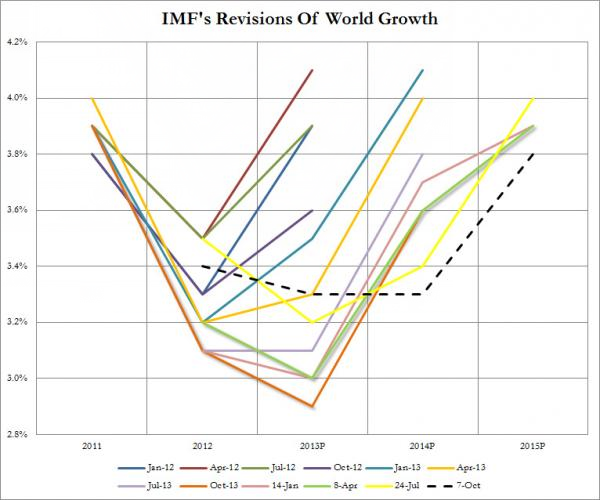 IMF global growth forecasts have been totally hopeless, with one downgrade after another. The latest forecast takes the cake for ridiculousness, not only because of the direction, but also because of the rationale. 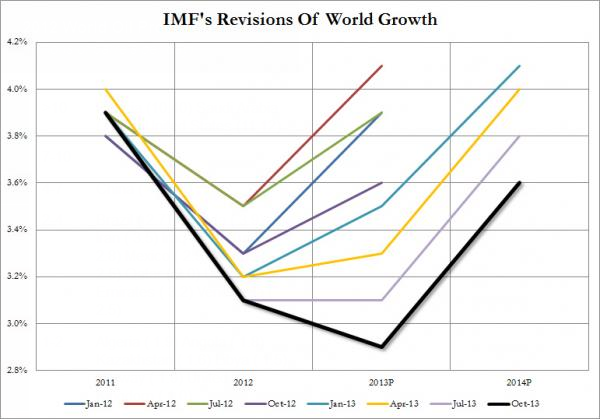 Please consider IMF Cuts Global Economic Growth Forecasts. The International Monetary Fund has cut its growth forecasts for the global economy on the back of a slowdown in China, looming recession in Russia and continuing weakness in the eurozone. The Washington-based fund warns that the boost from lower oil prices is being outweighed by a host of negative factors and it now expects global growth to edge up only slightly from 3.3% last year to 3.5% this year. That is down from a 3.8% forecast for 2015 in its World Economic Outlook published in October. It forecasts growth picking up only slightly next year and cut its 2016 forecasts from 4% to 3.7%. That forecast actually seems like rose garden material. But the reasons for the downgrades are even more amusing. “New factors supporting growth – lower oil prices, but also depreciation of euro and yen – are more than offset by persistent negative forces, including the lingering legacies of the crisis and lower potential growth in many countries,” says Olivier Blanchard, IMF director of research. Depreciation of the Yen and Euro are "New factors supporting growth." Yet, if the euro and Yen sink, the dollar will rise. So isn't a rising dollar bad for the US? Apparently not. In fact, the IMF raised its US forecast to 3.6% this year, up from 3.1% in October. The IMF says the "US sees a boost from lower oil prices". Europe and especially Japan are more dependent on (and benefit from falling oil), but price deflation (primarily caused by falling oil prices) supposedly hurts Europe and Japan. If that doesn't cause you to scratch your head, this will. Amazingly, it took the IMF all year to figure out Russia was in trouble in 2015. The sharp downgrade in the IMF’s outlook to a 3% contraction in 2015 from modest growth of 0.5% forecast back in October, follows official figures showing the Russian economy contracted for the first time in five years in November. Zerohedge has some amusing historical charts. The IMF saw 2013 world growth at 4.1% when the S&P500 was at 1,400 and now that it sees 2013 growth at the lowest ever in the series, 2.9%. 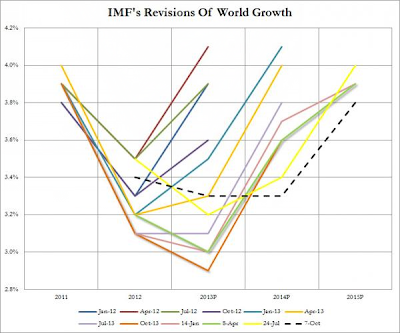 2014-10-07: IMF Comedy Hour: The Complete History Of The IMF's Growth "Forecasts" Since 2012. Mentally make an adjustment. The IMF's global growth forecast is down from 3.8% in October to 3.5% now. IMF forecasts should come with this warning: For Amusement Only.